The TV sitcom is something that the Brits do particularly well. We have so many incredible successes but Capricorn Research’s all time favourite was ” One Foot in the Grave ” with the inveterate moaner, Victor Meldrew, who constantly found the normal incidents of life were stacked up against him. The series begins with Victor losing his job as a security guard and being replaced by a small box. As he is close to retirement age anyway, he has to face the prospect that he is on the last lap of his life with one foot firmly in the grave. The programmes invariably deal with Meldrew’s battle against the problems he creates for himself. His efforts to keep himself busy, while encountering various misfortunes and misunderstandings are the themes of the sitcom. Victor finds himself at war with the world and everything in it, cursed with misfortune and always complaining. He is constantly battling against all that life throws at him as he becomes entangled in complicated plots. The name “Victor” was ironic, since he almost always ends up a loser. He believes that everything is going wrong for him all the time, and he has the right to be angry and upset because it’s not his fault it’s every one else’s fault. Victor is a tragic comedy character and sympathy is directed towards him as he becomes embroiled in complex misunderstandings, bureaucratic vanity and, at times, sheer bad luck. How to search for the appropriate astrological symbol for this situation. Some might suggest the 8th house with its association with death, but this is not what we are looking for as Victor is coming near to the end but not there yet. The end in astrology would be symbolised by Saturn, the planet of old age. The last sign is Pisces. 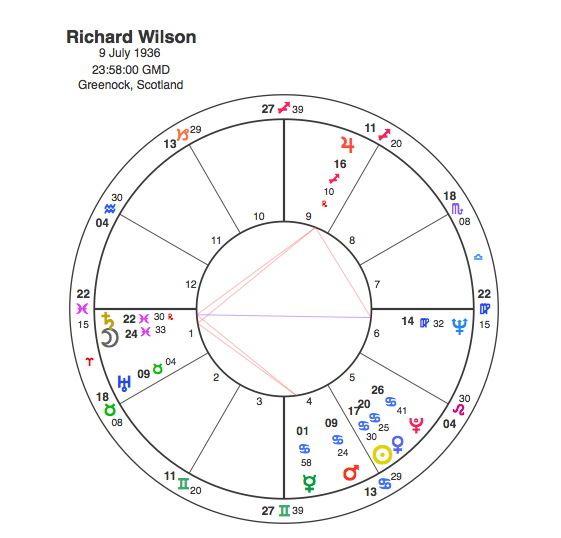 It is entirely appropriate that the actor who played Victor, Richard Wilson had Saturn rising in Pisces conjunct his Moon. There have been so many examples of the charts of actors that are well known for a particular role having charts that describe that character of the part and this chart is no exception. It is clearly the chart of Victor Meldrew. The signs that have the closest link to old age are Capricorn and Cancer and Wilson / Meldrew has 5 planets in Cancer. Mars in Cancer has a very strong link with old men as seen in the many charts of the Dad’s Army characters. Victor Meldrew has Mars in Cancer conjunct Mercury in the 4th house, and a more accurate symbolic description of someone who spends his whole life sitting at home moaning about the state of the world, would be impossible to find. Planets close to the Ascendant are the things we express the most strongly. Pisces is a Water sign, it deals with the intangibles in life, it is not logical, it exists more to feel things. Its particular connection is with the intangible realm of spirit. The energy that it has is one of compassion, devotion, faith and belief in something. The Moon in this sign, is particularly strong in this respect. So the Moon in Pisces stands for belief. Saturn is the most negative of all planets, its about restraint and obstruction. Its polar opposite, Jupiter says yes in a big way. Saturn says an emphatic no. So if someone has the Moon conjunct Saturn in Pisces on the Ascendant, the thing that they will be most known for saying is ” I don’t believe it “. Victor’s catchphrase is so famous, that Richard Wilson is still plagued by people repeating it back to him in the street over 20 years after the show began. One Foot in the Grave was first shown on Jan 4th 1990. Straight away the chart shows us the picture. The Sun is in Capricorn conjunct Saturn and Neptune in the 4th house. What better way to describe Victor ? This conjunction is also square to the Moon in Aries nicely describing his anger and annoyance at the vicissitudes of life. Richard Wilson’s first emergence as a TV actor occurred in 1977 to 78 when with Pluto square his Sun he had parts in shows including ‘The Sweeny’ and ‘Some Mothers Do Have ‘Em’ and portrayed a regular character in the show ‘A Sharp Intake of Breath’ with David Jason. One Foot in the Grave was first shown in 1990. Saturn was opposite Wilson’s Sun. When the show achieved peak popularity between 1991 and 1993 both Uranus and Neptune were opposite his Sun. Victor’s long-suffering, tolerant and kind-hearted wife, Margaret was played by Annette Crosbie. Margaret is a conventional straight character shown by the Sun conjunct Saturn with the Moon in Capricorn. 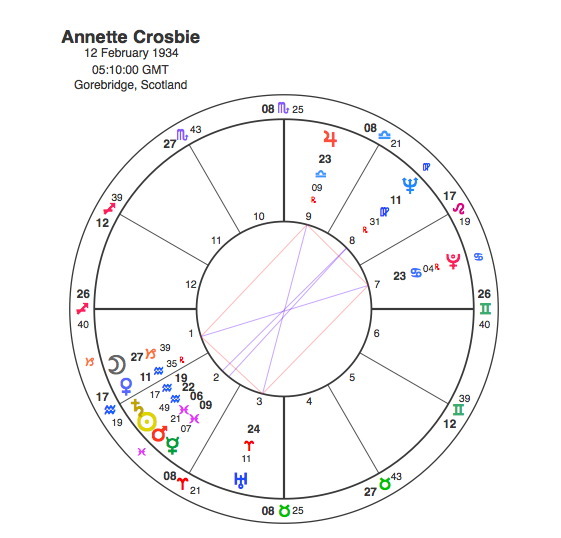 Her Moon is part of a powerful Grand Cross showing the constant emotional strain that she has to live with. The main opposition here is the Moon to Pluto in the 7th house of marriage. She tries to maintain a degree of calmness ( Moon in Capricorn ) and to rise above her husband’s frustrations. However, she is too often engulfed in the same folly and often vents her anger, usually at Victor who bears the brunt of it all. She sums up her relationship with Victor “Victor’s the most sensitive person I know ” ( Victor has the Sun, Moon and Ascendant plus 5 other planets in Cancer or Pisces, the most sensitive pair of all the signs ) and that’s why I love him. And why I continually want to ram his head through a television screen ” ( Margaret Moon opposite Pluto in the 7th ). Pluto was square to Annette Crosbie’s Sun in 1992 – 3 as the show reached its peak with regular audiences around the 16 million mark. Capricorn Research has reached that dreaded moment, the second Saturn return and recognises a daily growing resemblance to Victor Meldrew. But the lyrics from the show still provide hope for us all even against the inevitable descent into old age. And now I’m past my own sell-by date. I’ve just got too many miles on the clock. After reading this article and all the others on the website everyone would have to be convinced of the ultimate truth of astrology. Only a real Victor Meldrew could say ” I don’t believe it “.